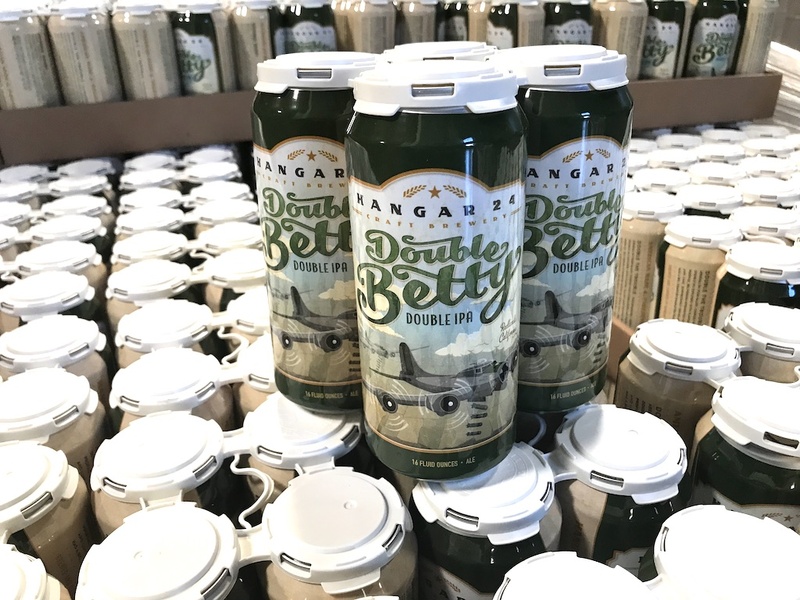 (REDLANDS, CA) – Not only is Double Betty IPA back for 2018 at Hangar 24 Craft Brewing, it will come in a new package as this big beer with a complex character moves to four-packs of 16-ounce cans. Double Betty IPA will be released at the Redlands Taproom and the Lake Havasu Brewery & Grill on Wednesday, March 7. The release of Double Betty IPA will also launch Hangar 24’s ambitious Rotating IPA Series, with brand new IPAs expected to debut at intervals all throughout 2018. Announcements on some of these new and exciting IPAs will come at a later date. Why the move from 22-ounce bottles to cans for Double Betty? The benefits are too numerous to list in their entirety, but cans are better at protecting beer from light, are lighter to transport therefore reducing their environmental impact, won’t shatter, and the elimination of breakage makes it fit in better with an adventurous lifestyle of hiking, camping, river rafting and going to the beach. More canned Hangar 24 Craft Brewing beer is ahead in 2018. Double Betty IPA joins Orange Wheat, Betty IPA and 24 Blonde Ale in the canned format, but will be the only one of the four packaged exclusively in cans. Double Betty IPA is also available in draft format from kegs. Our original Betty IPA is one our pride and joys, so when it came to making a double version, everything was amplified, including the hop flavor. Galaxy and Equinox hops were added to the profile, complementing the original Betty hop bill of Mosaic, Citra, Simcoe and Centennial. Notes of stone fruit and citrus explode from every sip, while still being surprisingly drinkable and incredibly balanced. Double Betty IPA clocks in at 10.1 ABV. Be one of the first to try the 2018 debut of Double Betty IPA when the Redlands Taproom and Lake Havasu Brewery & Grill open at 11 a.m. on Wednesday (March 7). It will be available in eight-ounce pours. Double Betty IPA cans will be available for purchase exclusively at the Redlands Taproom at the outset of the release, and arrive at craft beer retailers later this month (date to be announced). Hangar 24 is an independently owned craft brewery with locations in Redlands and Lake Havasu City, Arizona. The company produces a diverse award-winning line of beers ranging from the best-selling Orange Wheat to the exclusive barrel-aged Barrel Roll Series, including the renowned Pugachev’s Cobra. Visit hangar24brewing.com, or find us on Facebook, Instagram and Twitter.